A zoned system is a system that’s designed to give fine-tuned control over your heating and cooling system. This is done by creating zones in your home with the ability to control the flow of air into each of them, depending on their needs. 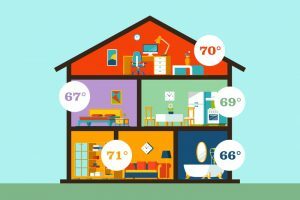 If you’re someone who feels like the front of their home is always stuffy while the back is always hot, a zone control system can help you accommodate the particular needs of your space. We provide fine-tuned control by installing dampers throughout the ducts and putting a thermostat in each zone of your home. The thermostat controls the relevant dampers surrounding it. Simply closing off the vents won’t have the same effect as controlling your heating via dampers. As we mentioned above, zone-controlled heating provides increased comfort for your home. Zoned heating helps eliminate drastic temperature variations in your home. For example, if you live in a two-story home, it’s common for the second floor to remain hotter than the first because heat rises. With a zone-controlled system, you can ensure that the heating power is fine-tuned for the space rather than blasting heat throughout your entire home and just hoping that it sticks in the places where you need it. When you provide more heat to the places that you need it, you’ll save yourself money. Sometimes homeowners will run their heaters at high temperatures or for long durations in an attempt to heat spaces that naturally run a little cold. This is an inefficient and costly way to run your system. With zone-controlled heating, you can just provide more heat to the spaces that need it. When you don’t overwork your system to overcompensate for uneven heating and cooling needs, you’ll put much less wear and tear on your system. When you put less daily wear and tear on your system you’ll help it last a lot longer—saving yourself a headache and money! If you want to put a zone-controlled heating system in your home this winter contact Cowboys Air Conditioning & Heating. You can trust our team with any and every heating service you need.